Summertime Strawberry Dinner – Pao Says, "Open Wide!" After a long day in the clinic, I don’t want to spend hours slaving away in the kitchen. Don’t get me wrong! I love cooking and I enjoy spending time on it, but when I’m seeing patients from 9 am until 7 pm (sometimes foregoing a proper lunch break), all I want to do when i get home is eat. This dish is quick, easy, and delicious, so its perfect to whip up when I want to be eating within 20-30 min of getting home. I made this specific dish with pork chops, but you can sub the pork for chicken breast, too! **Ensure that your pork chops (or chicken) are at room temperature- If I can, I typically set my frozen meats out in the sink to defrost during my lunch hour, or I defrost them in the fridge overnight and then let them sit out, after being seasoned, for about 20-30 min. This ensures consistent cooking temp throughout, which is important when cooking pork or chicken. Brush either side of the meat with olive oil and sprinkle with salt and pepper. Grab a stainless steel pan and get it to medium heat on your stovetop. Cook the pork chops (should take about 3-4 minutes on each side depending on the thickness) and then set aside on a foil-covered plate to rest. While the chops are cooking, whisk together the dressing for your salad: 3 tbsp of balsamic vinegar, 1 tsp dijon mustard, 1 tsp honey, a pinch of salt, and about 1/3 cup of olive oil. Set aside. 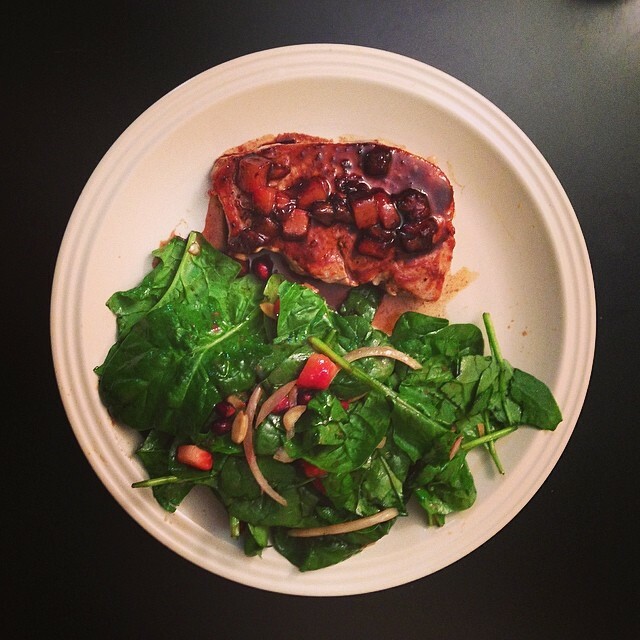 Once you take the pork chops off the heat and set them aside, grab the balsamic. In the same pan, combine the half-cup of balsamic vinegar and half-cup of strawberries. The vinegar will deglaze the pan… essentially picking up the flavorful bits that stuck to the bottom during the cooking of the meat- with a wooden spoon, scrape the bottom of the pan to ensure everything is mixed together. Once you notice the sauce begin to reduce and thicken, take it off the heat. This whole process takes about 3-5 min. Combine the spinach, remaining chopped strawberries, sliced onions, and sliced almonds in a salad bowl. Dress and toss your awesome summery salad with your homemade dressing. Top your pork chops with your fancy sauce, and dinner is served!